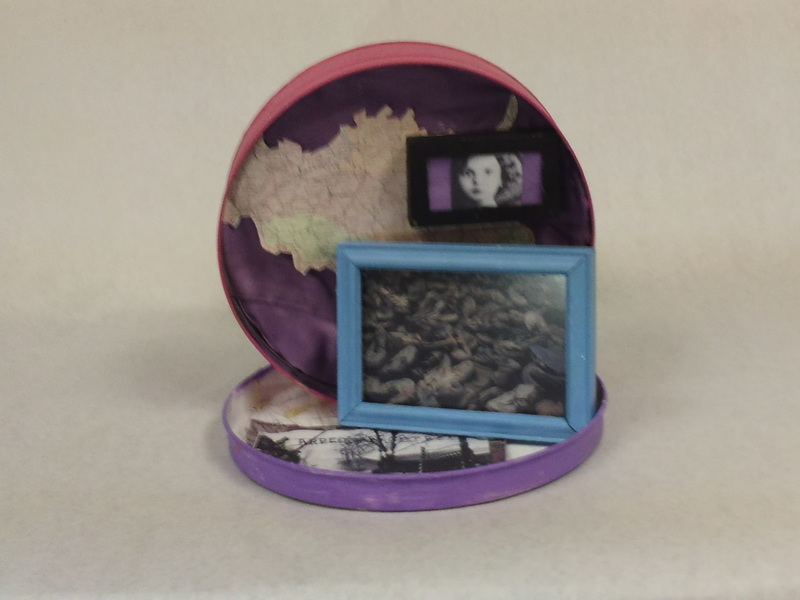 This shadow box represents the important, and horrific events that occurred in Lilly Appelbaum Malnik’s life. The map in the background is a map of Belgium; her home country. Next to the map is a photo of Lilly when she was a child in a box. I choose this because she was separated from her family at a young age. Then on the bottom of the box there is a photo of the gate at Auschwitz, because she was in the concentration camp. On top of that is a photo of all of the shoes taken away from the Jews; this represents the fact that she was in a death march and survived. The last symbol is the outside of the box itself. Some people chose to make it very dark colors, but after hearing an interview about Lilly’s, life I saw that she was a very flamboyant person, so I choose to celebrate that part about her. I painted the exterior bright colors to celebrate the childhood that the Nazis took away from her. Lilly crept from the kitchens with a pot of potatoes clutched in her bony fingers. She hid in the shadows as two SS officers walked by conversing loudly. The officers walked past her, and she continued on her journey in the darkness to the barracks. She walked slowly and carefully behind the barracks, hiding behind the buildings every so often so that she wouldn’t be noticed by the officers. Earlier that day she had seen a train pull in with thousands of Hungarian Jews on it. The number of men, women, and children in the cars shocked her. Every single one of them had been chosen to be killed.They were placed into barracks to be held overnight to be gassed in the morning. They weren’t given the small ration of food that night, because they were to be killed. In the middle of the night she snuck out of her barracks and went into the kitchens, grabbed a pot of potatoes meant for tomorrow’s soup and took them to the barracks where the Hungarians were being held for the night. She put the pot down on the ground in front of the door and opened it. Hundreds of women and girls were squished into bunks, most weren’t sleeping, but crying and holding on to family members. She picked up the pot again and walked through the door. Lilly walked to the closest bunk and gave each women on it a potato. The women started to notice her, and crowded around the pot all snatching at the potatoes. Suddenly the blinding lights flickered on and the shouting began. Lilly Appelbaum Malnik was born on November 5,1928 in Antwerp, Belgium. Her mother and father separated before she was born. Her mother moved to Brussels when Lilly was a child with her brother and sister. Being the youngest, she was left with her grandparents in Antwerp. At age eleven after her grandmother died, she moved to Brussels to be with her mother. In 1940, the Nazis invaded Belgium. The Nazis started to take people to work, but then the people were never heard of again. So her mother tried to hide her sister, but the man who her sister was staying with told the Nazis about her, and she was taken away to a concentration camp. The woman who found the place for her sister to hide told the Nazis that her mother and her brother were Jewish, and they were taken away. During this time, Lilly was in a hospital recovering from having her tonsils removed, so she wasn’t taken away. She was taken in by her aunt and uncle who lived out of the city. She was in hiding until 1944. During that time she worked in a factory and also gave manicures at a salon near where she lived. One day a new person moved into their apartment building, and they learned that they were Jewish and threatened to tell the Nazis that they were Jews, so they had to leave. Lilly and her remaining family went into hiding again, but they were captured and sent to Birkenau. The first day in Birkenau her aunt was killed and she was in was chosen for labor. The next morning after roll call she was given a tattoo. From then on she was known as A-5143. After a few weeks of hard labor the officers were asking for people to go to another camp to work in the kitchens, so she volunteered. Lilly was taken to Auschwitz to prepare the food for the other people in the camp. Many months later they were informed that the Russians were coming and they had to leave, so the Nazis forced them to march for days, then take cattle cars and, then march again. They were taken to Bergen-Belsen to stay away from the Russians. Lilly was liberated on April 15, 1945, but while at Bergen-Belsen she had contracted gangrene and had to be taken to a hospital to be treated. She stayed there for two months. After recovering from the illness Lilly returned to Belgium to live with her aunt, her only family in Europe who had survived the Holocaust. She lived with her aunt for a little while then got word from her father that he wanted her to join him in America. Lilly left Belgium immediately and was reunited with her father in America.